ACCDB Password 1.3 Free Download - Password Recovery tool for MS Access 2010 accdb and accde databases. Password Recovery tool for MS Access 2010 accdb and accde databases. 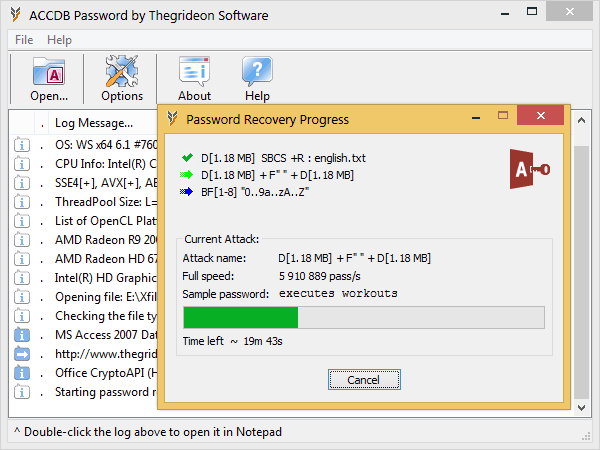 ACCDB Password by Thegrideon Software is advanced password recovery tool for MS Access databases (*.accdb, *.accde) with AES encryption (MS Access 2010 format). Mask based and Brute-force with length and charset selected. Advanced keyboard layouts aware recovery technique (patent pending). Highly optimised multithreaded code and GPU utilization with innovative (patent pending) methods guarantee fastest recovery speed. Statement: First, please download the orginal installation package by clicking the download link. Of course you may also download it from the publisher's website. Using ACCDB Password crack, key, patch, serial number, registration code, keygen is illegal. The download file hosted at publisher website. We do not provide any download link points to Rapidshare, Hotfile, Depositfiles, Mediafire, Filefactory, etc. or obtained from file sharing programs such as Limewire, Kazaa, Imesh, Ares, BearShare, BitTorrent, WinMX etc. Software piracy is theft. If you like ACCDB Password please buy it.